Figure A. APC conjugated rat anti mouse CD3 (MCA500APC) and FITC conjugated Rat IgG2b isotype control. Figure B. APC conjugated rat anti mouse CD3 (MCA500APC) and RPE conjugated rat anti mouse CD4 (MCA4635PE). All experiments performed on murine splenocytes in the presence of murine SeroBlock (BUF041A). Rat anti Mouse CD4 antibody, clone GK1.5 (MCA4635GA) used for the identification of CD4 expressing cells in tumors by immunofluorescence. 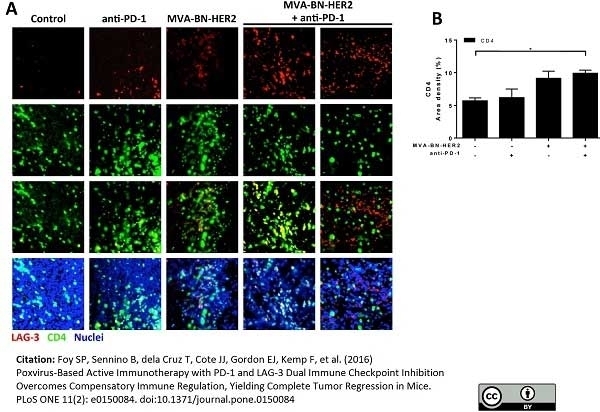 LAG-3 and CD4 expression in the tumor microenvironment after MVA-BN-HER2 and anti-PD-1 therapy. (A) Tumors from mice treated with MVA-BN-HER2 and/or anti-PD-1 were collected on day 16 and stained for LAG-3 (red), CD4 (green), and nuclei (DAPI, blue). (B) The area density for CD8+ T cells. * p<0.05. n = 3–4 mice/group. Poxvirus-Based Active Immunotherapy with PD-1 and LAG-3 Dual Immune Checkpoint Inhibition Overcomes Compensatory Immune Regulation, Yielding Complete Tumor Regression in Mice. FITC conjugated Rat anti Mouse CD4 antibody, clone GK1.5 (MCA4635F) used to identify CD4 expressing cells in mouse spleen cryosections by immunofluorescence. 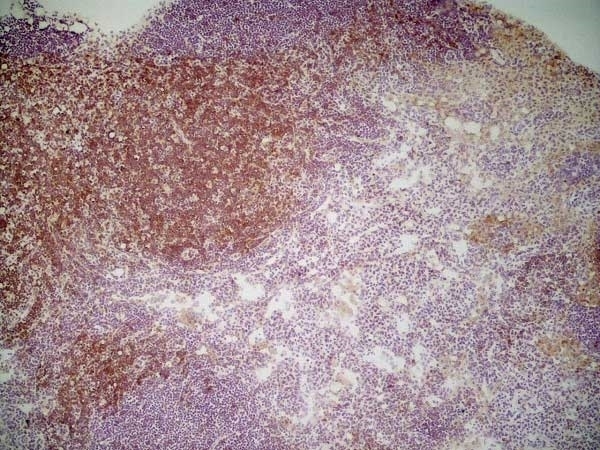 Intrafollicular location of MZB cells in B6.TC spleens. A. Representative spleen sections from 3 mo old B6.TC (left) and B6 (right) mice stained with Moma-1-FITC, CD1d-PE and B220-PB. 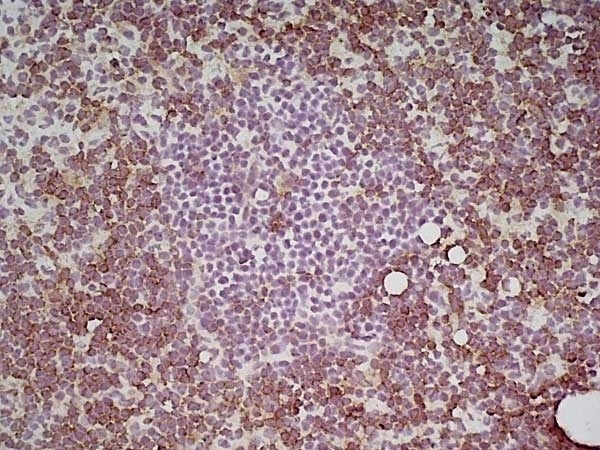 The B220+ CD1d+ MZB cells show as bright pink while the other B cells show as blue. The ring of Moma-1+ metallophillic macrophages delineates the MZ inner edge. B. Percentage of CD1d+ B220+ B cells relative to total B220+ B cells outside (MZ) and inside (FO) the Moma-1+ ring in 3 mo and 10 mo old B6 and B6.TC mice. The data show means and standard errors of the mean (SEM) calculated of 4 MZ and FO areas for each mouse. ***: p < 0.001 for t tests. C. Representative spleen sections from 10 mo old B6.TC (left) and B6 (right) mice stained with CD4-FITC, CD1d-PE and B220-PB. Boxed areas show multiple contacts between green B6.TC CD4 T cells and pink MZB cells, but not in the B6 spleen. Original magnification: 200X. From: Zhou et al. BMC Immunology 2011 12:7. Rat anti Mouse CD4 antibody, clone GK1.5 recognizes mouse CD4, a ~55 kDa protein also known as Ly-4 and L3T4. CD4 is a single chain transmembraneous glycoprotein which belongs to the immunoglobulin superfamily, and is primarily expressed on T helper cells, peripheral blood monocytes and tissue macrophages. CD4 is also expressed on a subpopulation of regulatory T cells (CD4+ CD25+), which play a key role in the maintenance of self tolerance. Rat anti Mouse CD4 antibody, clone GK1.5 has been reported to block CD4+ T-cell activation. It blocks class II MHC antigen-specific binding, thereby inhibiting functions such as class II MHC antigen-specific proliferation and the release of lymphokines. It may also be used for in vivo and in vitro cell depletion of CD4+ T-cells. 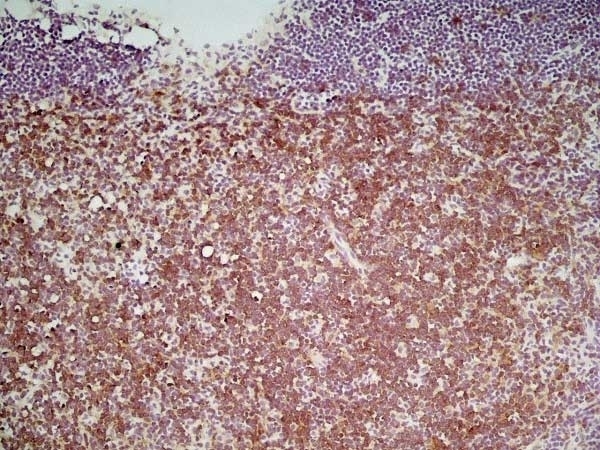 Spleen cells from immunised Lewis rats were fused with cells of the SP2/0 myeloma cell line. Dialynas, D.P. et al. (1983) Characterization of the murine T cell surface molecule, designated L3T4, identified by monoclonal antibody GK1.5: similarity of L3T4 to the human Leu-3/T4 molecule. J Immunol. 131 (5): 2445-51. Wilde, D.B. et al. (1983) Evidence implicating L3T4 in class II MHC antigen reactivity; monoclonal antibody GK1.5 (anti-L3T4a) blocks class II MHC antigen-specific proliferation, release of lymphokines, and binding by cloned murine helper T lymphocyte lines. J Immunol. 131 (5): 2178-83. Dialynas, D.P. et al. (1983) Characterization of the murine antigenic determinant, designated L3T4a, recognized by monoclonal antibody GK1.5: expression of L3T4a by functional T cell clones appears to correlate primarily with class II MHC antigen-reactivity. Zhou, Z. et al. (2011) Autoreactive marginal zone B cells enter the follicles and interact with CD4+ T cells in lupus-prone mice. Näher, H. et al. (1985) Dynamics of T cells of L3T4 and Ly 2 phenotype within granulomas in murine listeriosis. Clin Exp Immunol. 60 (3): 559-64. Ye, X. et al. (2000) Transient depletion of CD4 lymphocyte improves efficacy of repeated administration of recombinant adenovirus in the ornithine transcarbamylase deficient sparse fur mouse. Gene Ther. 7 (20): 1761-7. Chu, N.R. et al. (2000) Immunotherapy of a human papillomavirus (HPV) type 16 E7-expressing tumour by administration of fusion protein comprising Mycobacterium bovis bacille Calmette-Guérin (BCG) hsp65 and HPV16 E7. Pletinckx, K. et al. 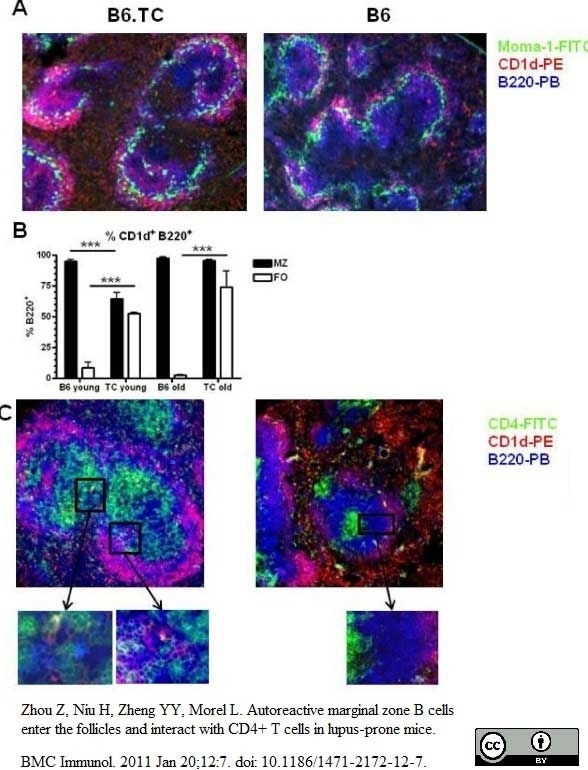 (2015) Immature dendritic cells convert anergic nonregulatory T cells into Foxp3- IL-10+ regulatory T cells by engaging CD28 and CTLA-4. Foy, S.P. et al. (2016) Poxvirus-Based Active Immunotherapy with PD-1 and LAG-3 Dual Immune Checkpoint Inhibition Overcomes Compensatory Immune Regulation, Yielding Complete Tumor Regression in Mice. PLoS One. 11 (2): e0150084. Steinl, D.C. et al. (2016) Noninvasive Contrast-Enhanced Ultrasound Molecular Imaging Detects Myocardial Inflammatory Response in Autoimmune Myocarditis. Circ Cardiovasc Imaging. 9 (8): .